Thirteen St. George Middle School students participated in the 2018 Charleston You Be The Chemist Challenge at the College of Charleston on Mar. 10. Qualifying students were identified by a school-level exam given to over 200 students at SGMS. You Be The Chemist is a national competition sponsored by the Chemical Education Foundation (CEF). The regional, state and national challenges are generously supported by Dow Chemical Company, BASF, Brenntag North America, Shell Oil Company and other corporations. The objective of the program is to encourage students to explore chemistry concepts and their real-world applications. 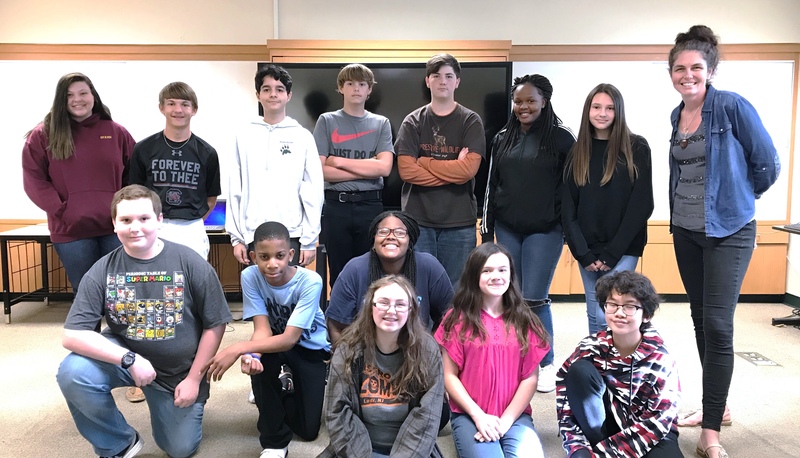 Participating SGMS students are Ragan Hobart, Trevor Hilton, Youcef Benaissa, Jace Reeves, Bryce Walters, Alaysia Lemon, Rylee Chubb, Ernie Knight, Jaquarius Hezekiah, Ashia Spruill, Mary Amelia Abols, Nathan Nguyen, and Katey Bush. The team’s mentor is Caroline Weathers, 7th grade science teacher.